An Israeli military helicopter has fired two missiles at a car in the Gaza Strip, killing three people. Palestinian officials say all the victims were members of the militant group Hamas. The Israeli military has confirmed that Hamas members were the target of the attack, not far from the Jewish settlement of Netzarim. A spokesman said the three men were recently involved in "numerous terror attacks against Israeli civilians". A day before the attack, the Israeli Chief of Staff, General Moshe Yaalon, said the army would step up its operations against militant groups in the Palestinian territories. "In the light of the intensification of the activities of the terrorist organisations over the last few weeks, we will intensify our anti-terror operations," he told army radio. Israeli government spokesman Avi Pazner said the men were planning additional attacks. "We stopped a murder in the making. We saved many human lives," he said. "A missile from the sky hit the car," said Ahmed Asmat, a farmer who was working in his greenhouse near the explosion. 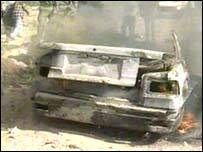 Ambulances raced to the scene, where Palestinians had surrounded the burning remains of the car, trying to extinguish the flames with sand. "The explosion led to a huge fire in the car. I started to run with other farmers who live nearby," said a witness, who gave his name as Bashir. Some in the crowd vented their anger at the Palestinian leadership. "I spit on the Palestinian Authority and those who brought them here," screamed one person at the scene. The Israeli air force has routinely targeted militants with air strikes. Last month, three militants from the Islamic Jihad group were killed when Israeli helicopters fired missiles at a car in the Gaza Strip. "The Palestinian Authority has accused the Israelis of escalating the conflict"